Station Latitude: 45:06:21 N Longitude: 071:17:25 W Altitude: 1870 ft.
1 Rain season: Jan 1st to Dec 31st. 2 Snow season July 1st to June 30th. 3 Snow manually measured usually around 7AM and 7PM. 4 Updated at Noon Central Time. 5 Estimated amount of water needed to replace the water used by plants and evaporation from the past week. (Negative numbers mean amount of water needed, positive numbers mean excess water is present). 6 Air Quality Index is provided by Minnesota Polution Control Agency and is updated hourly between the hours of 6AM and Midnight. 10 Historical average only to day 19 of just the month of April for this station since 2006. 11 Historical average rain this season to day 19 of April for this station since 2006. 12 "My Forecast & My New Forecast" are produced by WXSIM, an Interactive Local Atmospheric Modeling System. The Model is optimized for the First Conn. Lake area of Pittsburg, NH. It is run automatically on this stations server seven times per day. Lo 38 °F NWS forecast: Areas of drizzle and fog with a slight chance of showers. Mostly cloudy, with a low around 38. Southwest wind around 10 mph. WXSIM forecast: Cloudy. A chance of rain. Scattered thundershowers possible. Breezy. Low 36°, but temperatures rising after midnight. Wind southeast around 9 mph in the evening, becoming south after midnight. Chance of precipitation 30 percent. Precipitation mostly less than a tenth of an inch. Hi 60 °F NWS forecast: Areas of drizzle before 7am, then patchy drizzle with a chance of showers between 7am and 10am, then showers likely after 10am. Areas of fog before 10am. Otherwise, mostly cloudy, with a high near 60. Southwest wind around 5 mph. Chance of precipitation is 60%. New precipitation amounts of less than a tenth of an inch possible. WXSIM forecast: Dense overcast. A chance of rain. Scattered thunderstorms likely, some possibly severe. Breezy and relatively mild. High 58°. UV index up to 3. Wind south around 9 mph, gusting to 16 mph. Chance of precipitation 30 percent. Precipitation mostly less than a tenth of an inch. 03/23/19 - 01:47 PM 13 inches of snow last night. The riding id great. 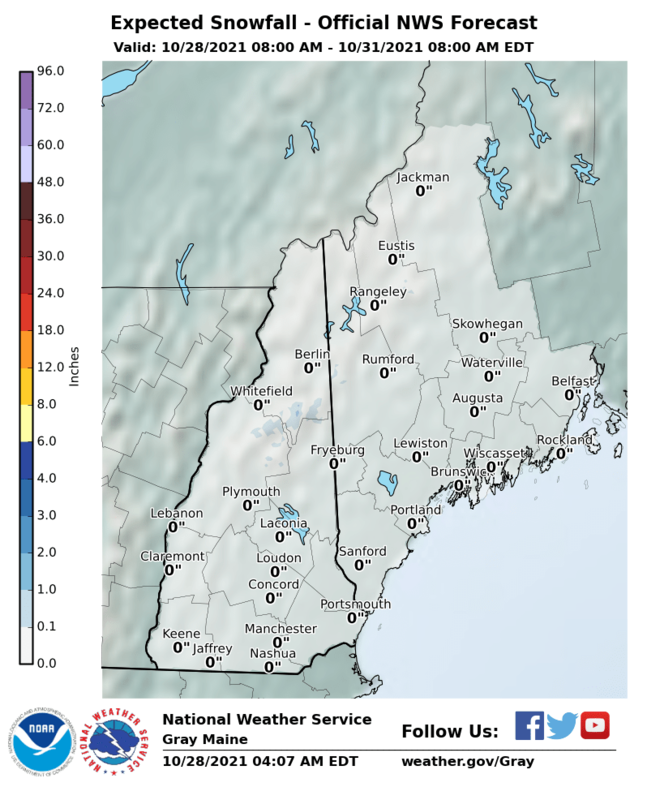 03/13/19 - 04:25 PM Looks like we are going to warm up over the next few day's. Stay tuned. 01/28/19 - 07:23 AM Looks like I had a program problem, we are back up and no data was lost. Sorry about that. 01/09/19 - 02:19 PM We have a new snow child, the snow was very icey so it didn't work very well. 01/03/19 - 08:17 PM Thanks to Alex the internet technician we are back online. No data was lost the weather server continued to run and collect information. 01/02/19 - 08:17 AM We picked up .5 inches of snow overnight and it's zero degrees. 01/01/19 - 07:48 AM We picked up two inches of heavy wet snow overnight with some ice. 12/30/18 - 10:24 AM I called the state Board of Public Utilities and filed a complaint. I don't think it will do any good but I called anyway. I did get a call from Consolidated Communications, they said it will be fixed anytime between now and January 6, 2019. 12/30/18 - 07:14 AM No internet, not sure what the problem is. The phone company said they will fix it by Jan. 6. Give me a brake. What a joke. Sorry for the outage. 12/22/18 - 11:14 AM Just got an email from Kevin Lassonde, Colebrook and Pittsburg trail systems are closed. He will update things for Pittsburg tomorrow once things freeze up. We lost about a foot of snow-pack here. 12/14/18 - 09:42 AM Trails will open Saturday December 15th. Caution, groomers will be operating during daylight hours. All trails west of Route 3 are open as of Saturday. There are significant trail closures due to logging east of Route 3. 12/01/18 - 06:54 AM Thanks to my wife for building the snowman. :-) Looks like a few inches of snow coming tonight. 11/04/18 - 06:49 AM 2 inches of heavy wet snow last night. We lost power for a few hours, no data was lost. 08/23/18 - 07:01 AM Problems with my detailed Home Page. I'm working a solution. 07/05/18 - 07:12 AM I'm having equipment problems as a result of the storms two nights ago. The replacement parts should arrive today to get the lower webcam back online. My DSL is working intermittently, Consolidated should be today as well. 05/01/18 - 09:15 AM My service provider is working on my website we could have momentary interruptions. 04/30/18 - 07:14 AM The lower webcam is back in operation, sorry for the outage. 04/05/18 - 07:48 AM The lower webcam is temporarily off-line. 03/17/18 - 07:36 AM 5 Degrees and partly cloudy. The last four days we have received 21 inches of snow. We have a snow-pack of 27.5 inches. 03/15/18 - 10:30 AM I'm revising last nights snowfall amount up to 7 inches with a snow-pack of 26.5 inches. 03/15/18 - 07:42 AM We picked up 5 inches of new snow giving us 26.5 inches of snow-pack. 03/11/18 - 07:07 AM It's cloudy and snowing lightly. We picked up 8 inches of new snow Giving us a snow-pack of 20 inches. 02/28/18 - 02:16 PM The NWS forecast is now working, I had to go back to an old version of the software, I'll upgrade it when it settles down. 02/23/18 - 05:55 AM Sorry for the outage, I made a significant upgrade to the weather server hardware. No data was lost. 02/22/18 - 05:33 PM The NWS forecast is now working, not sure what the problem was. 02/21/18 - 07:46 AM The detailed point forecast weather data is not currently available.The zone forecast data for NHZ001 (Northern Coos) will be displayed until the point forecast data is again available. PLEASE USE MY FORECAST (WXSIM) UNTIL NWS FORECAST IS FIXED. 02/04/18 - 06:56 AM 13.8 degrees and cloudy, we picked up 1 inches of new snow giving us 14 inches of snow-pack. More snow coming tonight. 02/02/18 - 07:55 AM 7 degrees and cloudy, we picked up 4 inches of new snow giving us 13 inches of snow-pack. 01/23/18 - 01:44 PM In an attempt to streamline and speed up the website loading I have deactivated several pages on the site. If a page you use is missing just send me an email and I'll reactivate it. 01/19/18 - 12:57 PM Sorry for the outage, I had to upgrade my service plan because of increased traffic. It was supposed to be transparent but....... No data was lost and forecasts are current. 01/03/18 - 08:02 AM 8 degrees and cloudy, we picked up 2.5 inches of new snow giving us 16 inches on the ground. 12/31/17 - 06:59 AM Dangerously cold wind chills expected. The dangerously cold wind chills will cause frostbite in as little as 10 minutes to exposed skin. Expect wind chills to range from 20 below zero to 40 below zero. 12/30/17 - 10:41 AM Temperatures will fall below zero again and will combine with the wind to produce wind chill readings of 20 to 30 below zero. This will be just the start of the cold, though, as cold air will overspread the entire area on Sunday and may produce even colder wind chill values region wide for New Years Eve night. Be VERY careful playing in the snow. 12/29/17 - 02:07 PM I have temporarily stopped using the NWS forecast on the home page. I'll put it back ounce they get the problem resolved. 12/29/17 - 01:48 PM The NWS forecast is having intermittent problems, My Forecast is running correctly. They know about the problem and are working on a fix. :-( Go to My Forecast for an updated forecast. 12/29/17 - 06:29 AM 18 BELOW and a few clouds. A Very Cold day in store for us today. If you go snowmobiling be very careful IT'S COLD!!! 12/21/17 - 08:34 AM 1.7 degrees and partly cloudy we picked up 2 inches of new snow giving us 13 inches on the ground. The trails open today, Be Careful. It's the first day of winter!! 12/20/17 - 07:54 AM 24 degrees and cloudy we picked up 3 inches of heavy wet snow giving us 12 inches on the ground. It looks like all the lakes are covered with skim ice. The lakes are not safe at all. 12/19/17 - 08:17 AM 3 inches of new snow giving us 11 inches on the ground. It's 26 degrees and snowing lightly. 12/14/17 - 08:08 AM 3.7 BELOW and partly cloudy. 2 inches of new snow giving us 11 inches on the ground. 12/11/17 - 07:34 AM Currently 18 degrees and cloudy with light snow. We picked up 2.5 inches of new snow giving us 5.5 inches on the ground. More on the way. 11/02/17 - 06:07 PM Back online, The power was off all week and the phone and Internet was up and down all week as well. The electric repair folks were from Chattanooga, Tennessee. They came a long way to get us back online. Big storm, the barometer went down to 28.91 during the storm that's low. I had three trees come down on my garage but I was lucky no major damage. 06/02/17 - 09:43 AM Back online, I had a internal network problem that has been resolved. No data was lost and the forecasts are now current. 05/01/17 - 01:26 PM Back online, a tree took out electric and telephone Saturday. Electric was back in an hour, two day's for the telephone company to get here :-( No data was lost. 03/16/17 - 07:25 AM It's 7 degrees and snowing lightly, so far we have picked up 11 more inches of snow showers :-) sense yesterday. We have 35 inches on the ground. It's almost spring. 03/14/17 - 07:28 AM The quiet before the storm, no snow yet but it's on the way. 13 degrees and cold. We have 14 inches of snow-pack. 03/13/17 - 08:05 AM 5 BELOW and clear. Snow on the way!! We have 14 inches of snow-pack. 03/10/17 - 07:31 AM 1 degree above zero and mostly clear. We picked up 1 more inch yesterday giving us a total of 6 inches from the storm. We have 14 inches of snow-pack. 03/09/17 - 07:15 AM 21 degrees and cloudy. We picked up 5 inches of fresh snow last night. We now have a snow-pack of 15 inches. 03/04/17 - 08:11 AM 5 BELOW and breezy. We picked up a half inch of new snow last night giving us a snow-pack of 11 inches. 02/26/17 - 07:34 AM 21 degrees and snowing lightly. We picked up 3.5 inches of heavy wet snow overnight giving us a snow-pack of 16 inches. 02/13/17 - 08:01 AM We picked up about 8 inches so far. It's hard to estimate the snow fall because of the blowing and drifting snow. I may adjust the amount after I get out in it. It's 15 degrees and snowing lightly, we have a snow-pack of 32 inches. 02/10/17 - 07:51 AM It's chilly in the Burg this morning 3 BELOW. 1.5 inches of new snow giving us a snow-pack of 26 inches. 02/09/17 - 07:30 AM 6 degrees and snowing lightly. We picked up a half an inch of new snow so far giving us a snow-pack of 25 inches. 02/06/17 - 07:59 AM 3 Degrees and partly cloudy. We picked up 5 inches last night giving us a snow pack of 27 inches. 02/03/17 - 10:31 PM Strange problem with web-page. "Resource Limit Is Reached" message was showing up. I contacted my service provider and the message disappeared. 01/28/17 - 07:49 AM 18 degrees and snowing lightly. We picked up 10.5 inches of snow and it's still snowing. We have a snow-pack of 25 inches. 01/27/17 - 07:56 AM 24 degrees and freezing rain. We picked up 3 1/4 inches of heavy wet snow. giving us a snow-pack of 15 inches. 01/18/17 - 07:31 AM About 1 inch of new snow so far. It's snowing lightly and 19 degrees. We have 13 inches of snow-pack. 01/17/17 - 07:34 AM 23 degrees and cloudy, 2 to 4 inches on the way. We have a snow-pack of 12 inches. 01/14/17 - 06:50 AM 9 BELOW and clear. We picked up about an inch yesterday but it mostly blew away. Our snow-pack remains at 10 inches. 01/12/17 - 11:49 PM Local Radar is working fine. I'm still working on NEXRAD radar. 01/12/17 - 03:38 PM I'm having problems with the "Radar Page". It should be fixed soon. 12/29/16 - 03:27 PM The problem with the webcam is a bad power supply. I have ordered a replacement from AXIS, it will be in next week. 12/29/16 - 07:28 AM The webcam problem is still being worked on, Looks like a good storm on the way stay tuned. 12/19/16 - 02:48 PM The webcam should be back online soon, I'm working on the issue. 10/23/16 - 02:06 PM 6.5 inches of wet snow last night. It caught me by surprise, I was expecting an inch or two. 06/10/16 - 08:50 AM Major upgrades underway. The station will be down quite a bit over the next few days. A lot of new features are on the way. 05/30/16 - 05:50 AM Very sorry for the long outage, my service provider Quality Host On-line had a major equipment failure. I have been assured that the problem will be rectified shortly. 04/16/16 - 07:22 AM Looks like a beautiful weekend in the North Country. We'll be fishing before you know it. 03/05/16 - 07:01 AM 2 BELOW and clear, we have 11 inches of snow-pack. 02/27/16 - 02:21 PM The problem has been resolved. Several server side settings had to be modified. Thanks for your patience. 02/27/16 - 09:09 AM Currently having technical issues, not sure whats going on. You may notice some temporary outages. I am working with my hosting service to resolve this. Thanks for your patience. 02/26/16 - 07:44 AM 12 degrees and snowing. What a difference a day makes. We picked up 4 inches overnight giving us 10 inches of snow-pack. 02/20/16 - 07:49 AM 5.5 inches of new snow and it's snowing heavy. We have 10.5 inches of snow-pack. 02/19/16 - 07:22 AM As a result of your generous donations I have added a low power LED light pointed at the snow gauge. This is on a timer and should stay on all night except when the daily videos are being created around midnight. Several of you have requested this recently. It will take a few days to get everything adjusted. 02/18/16 - 07:14 AM 6.7 Degrees and cloudy we picked up 1 inch of fresh snow giving us a snow-pack of 6 inches. "Think Snow". 02/17/16 - 06:43 AM 19 degrees and cloudy, we had .82 inched of rain yesterday and lost 7 inches of snow-pack. The high was 45 degrees, very unusual. "Think Snow". 02/14/16 - 07:15 AM 25 Degrees BELOW with a windchill of 43 BELOW. We have 10 inches on the ground. STRONG WINDS WILL CREATE DANGEROUSLY LOW WIND CHILL VALUES today. 02/13/16 - 07:18 AM 5 Degrees and snowing lightly. We have 10 inches on the ground. STRONG WINDS WILL CREATE DANGEROUSLY LOW WIND CHILL VALUES this evening. 02/12/16 - 07:00 AM 13 BELOW with a few clouds. We picked up 1/2 inch of new snow with a snow pack of 10 inches. This is well below the normal. 01/31/16 - 06:53 AM 27 degrees and partly cloudy. No new snow but we have 10 inches of snow-pack on the ground. The riding is good, get up when you can. 01/30/16 - 07:29 AM It's 15.9 degrees and cloudy. We picked up two inches of new snow overnight giving us a snow pack of 11 inches. 01/22/16 - 01:43 PM I just saw 3 sleds cross the cove at the bottom of the hill. Not sure I would try it yet. We currently have about 11 inches of snow pack. The riding should be fine north of us. 01/20/16 - 07:51 AM 8 Degrees and snowing lightly, we picked up about 4 inches of fluff giving us a snow-pack of 12 inches. The riding should be great get up when you can! 01/11/16 - 08:29 AM Station back online. Must have been all the power issues last night. Everything running, no data was lost. Forecast was just run and uploaded. 01/10/16 - 07:24 PM Approaching an inch of rain so far and quite windy, gusting over 30 MPH. 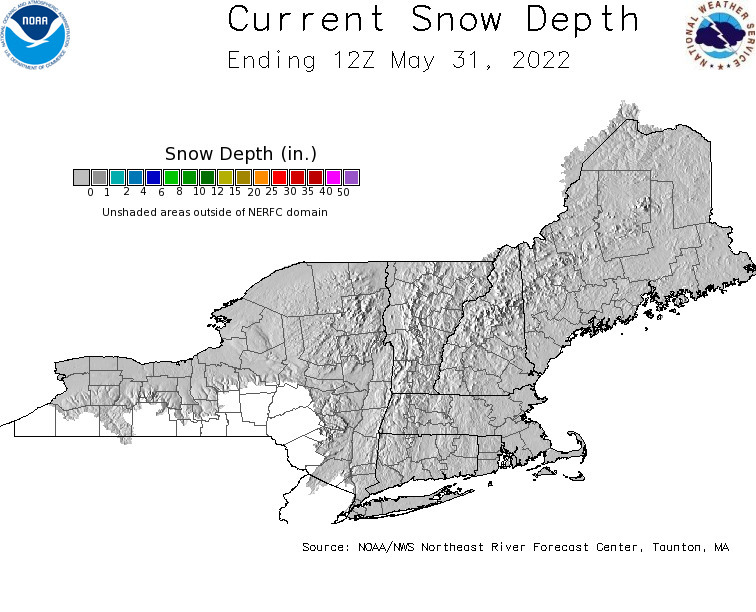 We lost a lot of the snow pack today. Still 39 degrees. Stay tuned. 01/09/16 - 09:23 AM We will get some rain tomorrow, that's not good. We need snow!! 01/04/16 - 07:45 AM Thanks to you all you are now using the number one ranked weather website in North America. 12/20/15 - 10:16 AM Please remember I'm making changes and enhancements to the website everyday so if you come across a problem PLEASE let me know. Email me at john@johnsnhweather.com Thanks. 12/15/15 - 01:08 PM OK this is getting serious, we need snow!!!!! 11/26/15 - 07:43 AM Thanks FairPoint the Internet problem seems to have been resolved. 11/24/15 - 03:02 PM Currently having intermittent Internet problems, FairPoint is here working on the problem. 11/08/15 - 01:31 PM New Space Weather page has been uploaded you can see it at Space Weather Page. 10/30/15 - 10:04 AM Lost power again, it's back on now the backup system worked fine. 10/21/15 - 08:33 AM It's a beautiful morning in the Burg. 08/28/15 - 11:42 AM The Fishing report page has been updated, you can see it at Fishing Report. 08/23/15 - 07:32 AM Server is down for service, OS problems sorry about that. 08/22/15 - 05:27 PM Server is back on-line. 08/22/15 - 02:29 PM Server will be off-line again for a few hours for normal maintenance. 08/22/15 - 08:34 AM Server will be off-line for a few hours for normal maintenance. 08/15/15 - 01:52 PM Hard drive issue the system will be back in about two hours. 08/14/15 - 11:09 AM Back on-line the upgrade was successful. Just a few things to work out. 08/14/15 - 07:01 AM The System will be off-line while I attempt to upgrade the server to Windows 10 Pro again. 08/13/15 - 05:11 PM The Fishing report page has been updated, you can see it at Fishing Report. 08/13/15 - 05:08 PM The System is back on-line that didn't go well at all. Will give it a shot in a few days. 08/13/15 - 03:32 PM The System will be off-line while I attempt to upgrade the server to Windows 10 Pro. 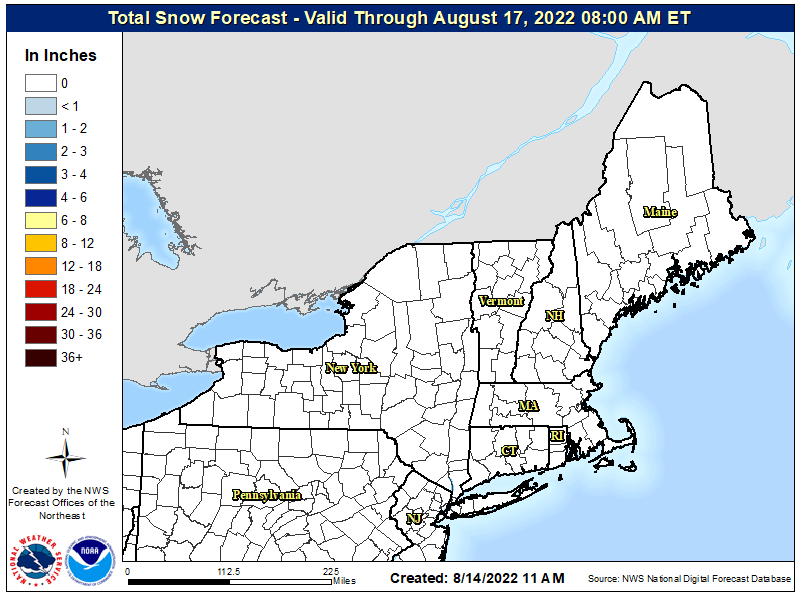 07/08/15 - 06:53 AM A lot of changes to the NWS Forecast, all of the icons have been updated, if you see any issues please let me know. 07/05/15 - 22:56 PM The Fishing report page has been updated, you can see it at Fishing Report. 06/12/15 - 08:19 AM Thunderstorms this afternoon and evening then it looks like a beautiful weekend. The fishing should be great. 06/06/15 - 10:10 AM Frost advisory posted for tonight, maybe down in the village, I don't think it will freeze on the hill. 05/07/15 - 07:19 AM The "Fishing Forecast" page is working, I didn't change anything. It must have been a data problem. 05/06/15 - 10:01 AM The "Fishing Forecast" page is not working, I am looking into this. If you ever see any page not working correctly please let me know. 04/22/15 - 07:00 AM Website back on-line, no data lost. Thanks Mark. 04/21/15 - 09:32 AM Website temporarily down, caused by power outage, should be back before long. 04/11/15 - 07:27 AM Weather server is back on-line. Both hard drives have to be replaced, never had anything like happen before. Everything was back at 1:17 this morning. No data was lost. 04/06/15 - 07:58 AM 1 ABOVE and partly cloudy, we picked up 1 more inch of snow giving us 22 inches of snow-pack. 04/05/15 - 06:44 AM 11.7F and snowing lightly, 3 inches of new snow so far. We still have 23 inches of snow on the ground. HAPPY EASTER!! 04/04/15 - 08:01 AM 31F and snowing moderately, 1 inch of heavy wet snow so far. We still have 20 inches of snow on the ground after yesterdays melt. 03/27/15 - 08:24 AM 28F and cloudy, we picked up 1.5 inches of heavy wet snow last night giving us 26 inches of snow-pack. 03/25/15 - 07:15 PM We went for a ride today the Trail Report is on the Snowmobiling Page. 03/22/15 - 07:31 AM 4.6 BELOW and still breezy. We picked up 1 inch of new snow giving us a snow-pack of 29 inches. 03/19/15 - 07:00 AM 1 BELOW and clear this morning, we have 29 inches of snow-pack, the riding is perfect. 03/18/15 - 07:54 AM 2.9F with light snow, it's cold and windy in the Burg this morning. We picked up another 5 inches of heavy snow, we have 31 inches of snow-pack. The trails are in perfect condition get up when you can. 03/17/15 - 08:01 AM 24F with light snow, we picked up 1 inch of new snow overnight we have 27 inches of snow-pack. The riding is perfect get up when you can. Happy St Patrick's Day!!! 03/15/15 - 07:43 AM 23F and light snow, we picked up 3.5 inches overnight giving us 26 inches on the ground. We will pick up another two inches today. 03/14/15 - 07:43 AM 23F and we had a trace of new snow last night. Looks like 6 to 10 inches on the way this weekend. We currently have 23 inches on the ground. 03/09/15 - 01:34 PM We picked up 5 inches of snow overnight giving us 30 inches on the ground. 02/13/15 - 08:17 AM Another VERY COLD DAY dress appropriately when you go riding. It will not get above zero today. 01/31/15 - 07:52 AM VERY COLD DAY dress appropriately when you go riding. 01/29/15 - 03:56 PM We went for a ride today the Trail Report is on the Snowmobiling Page. 01/24/15 - 05:13 AM Still working on "My Forecast" it seems to be having a problem getting new data. 01/24/15 - 04:48 AM Everything is back on-line. Running forecasts now, no data was lost. 01/23/15 - 10:29 PM Currently working on a problem with the weather server it should be back on-line in about two hours. No data is being lost. 01/22/15 - 06:08 PM We went for a ride today the Trail Report is on the Snowmobiling Page. 01/20/15 - 10:49 PM The latest Ridgerunners Trail Report on the Snowmobiling Page. Most of the trails are now open. 01/18/15 - 11:31 AM Looks like we will get 5 to 8 inches of wet snow tonight. You can see the latest prediction on the new snow information page that was added, you can see it at NOAA Snow Info Page Page. Lots of good information and all of the maps are clickable. 01/15/15 - 08:26 PM Ridgerunners Trail Report on the Snowmobiling Page. Most of the trails are now open. 01/14/15 - 09:38 AM A new snow information page has been added, you can see it at NOAA Snow Info Page Page. Lots of good information and all of the maps are clickable. 01/09/15 - 02:09 PM Ridgerunners Trail Report on the Snowmobiling Page. Most of the trails are now open. 01/09/15 - 08:58 AM Currently having a problem with "My Forecast" model it's a new version and something has gone crazy. Working the problem. 01/07/15 - 04:38 PM It's currently 7 below and breezy with light snow. :-) The upgrade is progressing as planned. 01/06/15 - 06:20 PM I just got a report of a ICE RIDGE on First Lake, "there is a huge ridge running north to south probably 2 miles long", Thanks Jim for the update. That ridge will likely cause problems since in the middle of the lake, the lakes are NOT safe. 01/05/15 - 07:47 PM Wind Chill as low as 45 BELOW please be careful. 01/05/15 - 07:58 AM Currently 12 above and windy with a wind chill of 5 below and a moderate snow shower what a difference a day makes. 01/05/15 - 07:45 AM I am still working on my new forecast model so keep checking back. When it's running properly "My Forecast" will be 15% more accurate. 01/04/15 - 03:27 PM Freezing rain currently, what a mess, it will get cold tonight. 01/03/15 - 11:02 AM I just got a report of a ICE RIDGE on Lake Francis. Not that anyone should be on it yet, just saying, be careful the lakes are NOT safe. 01/03/15 - 07:28 AM I am having some issues with the new version of my forecast model. I should be resolved shortly. 01/02/15 - 11:49 AM Ridgerunners Trail Report on the Snowmobiling Page. Most of the trails are now open. Picture will auto refresh every minute. LIVE webcam looking east. Magalloway Mountain to the right and Diamond Ridge to the left. New LIVE webcam looking east. You can see First Connecticut Lake through the trees. The snow data in the chart above is manually entered. If I am away I enter it when I get back. I have a friend who keeps track of it for me. This website is neither affiliated with nor endorsed by the National Weather Service, the town of Pittsburg or any other government agency. The weather data contained herein is offered without any warranties expressed or implied, and is meant to supplement NOAA weather forecasts and information. Never base important decisions that could result in harm to people or property on this weather information.